WILLEMSTAD - Gerrit Schotte wants to know who leaked at the Ministry of Justice. According to Schotte’s lawyer, Eldon Sulvaran, someone leaked a report from the Unusual Transactions Department (MOT), which contains information about the former Prime Minister of Curacao. The MOT information was obtained by criminal facts and was then leaked, according to the lawyer. MOT messages, according to the lawyer obtained by crime and then leaked. 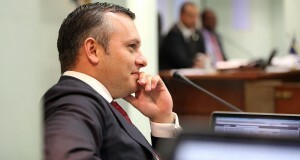 Last year it was announced that Schotte was mentioned fifty times in the report kept by the Unusual Transactions Department. These transactions are large cash deposits made by the Italian Francesco Corallo to Schotte’s accounts when he was a commissioner in the government of the Island Territory of Curacao (part of the Netherlands Antilles). Corallo transferred about 900,000 guilders to Schotte’s account.